Start increasing your conversions and click-thrus TODAY by putting the Power of Popups to work on your website. If you've been around internet marketing for any time, you're probably already familiar with popups and WordPress popup plugins. For some time now, marketers and bloggers have been praising these nifty utilities and crediting them with increasing their email opt-ins 100%, 200%, 400%, and more! That's because popups use motion and placement to grab a reader's attention and focus it on your opt-in offer. Readers have to take action and, if your offer is appealing, will take the challenge and opt-in to your site. You've got this fantastic sales tool that's already proven to work like a dream. Where marketers have used it for email opt-ins, they've been rewarded with spectacular results. Popups have proven that they have a unique and awesome power to get your website readers and visitors to stop and take action. or any of the dozens of other money-making offers you've got in your marketing arsenal? Why don't WordPress users use popups to increase click-thrus and conversions for these offers? Simple answer... because they haven't had a plugin that harnessed the power of popups to grab your reader's attention and LASER focus it on your irresistible offer. 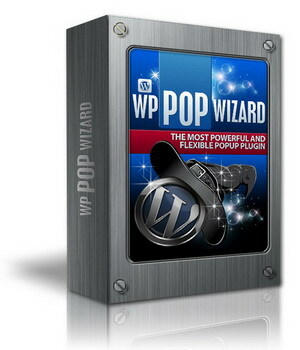 wpPOPWizard is the Most Powerful and Flexible WordPress Popup plugin you can buy. Just so you understand, wpPOPWizard is Powerful and Flexible. It's not the simplest popup plugin because with simplicity comes reduced function (less power) and fewer choices (less flexibility). Here's a brief list of just some of the things you can do with this amazing plugin. Here is a preview of one of the video tutorial showing you how to use wpPopWizard. More click-thrus and more conversions means just one thing - more money in your bank account. The quicker you get the Power of Popups up and running on your site, the sooner you'll start seeing the cash roll in. So for a limited time, I'm selling wpPOPWizard for the ridiculous LOW price of just $97.00! All you have to do is click the Add To Cart button below, and pay the CRAZY $97.00 price tag, it's that easy, and it's TOTALLY risk free! Order wpPOPWizard TODAY, and if within 60 days you don't think the package is suitable for you, simply email us and we will gladly refund your money...NO QUESTIONS ASKED! With Our Standard Multi-Site License, you can install this plugin on UNLIMITED sites/domains that YOU PERSONALLY OWNED. With Developer License, you can install on UNLIMITED SITES that you PERSONAL OWNED AND YOUR clients sites too. You Can also include this plugin when flipping your site, But you CANNOT sell this plugin by itself (you don't have resale right to this plugin). You'll have INSTANT ACCESS to the download page, where you can start using these plugin today.